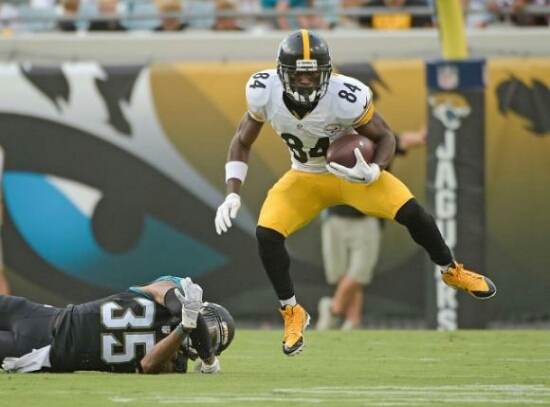 Steelers Fall Short to Jaguars 21-23 | "IT'S A STEELERS WORLD"! In a game with a fast start and plenty of opportunities led to a Pittsburgh Steelers 21-23 loss to the Jacksonville Jaguars Friday night at EverBank Field in Florida. Ben Roethlisberger needed just six plays that ended on a 45 yard touchdown pass to wide receiver, Martavis Bryant. Giving the Steelers 8-0 lead following a two-point conversion. ”We want to start fast,” Roethlisberger said. ”We got everybody involved. I told the O-line if you guys protect like that and open up holes in the run game, good things are going to happen. That’s what we need to do every time. We need to start fast like that”. Although a better outing than the previous game versus the Minnesota Vikings, backup Landry Jones still only completed 24 of 46 passes for 200 yards and a touchdown. He also was sacked twice, once in a very pivotal moment in the remaining minutes of the fourth quarter. Along with Jones’ problems with producing more than one touchdown in more than 3 full quarters, rookie receiver Shakim Phillips dropped a would be touchdown in the fourth quarter. Pittsburgh had to settle for a field goal. Head coach Mike Tomlin had said that “all healthy players” would be given an opportunity to play, he went against that leaving Landry in for the entire remainder of the game. “It wasn’t the outcome we desired obviously, but what awesome situations for the group to be in”, Tomlin said. “Some positive things, some negative things. I liked the energy and effort of the guys. We just came up short”. The energy and the effort were in fact good to see. But at some point in time you have to give hopeful backup quarterback like Tajh Boyd a chance to show what he has. Not saying Tomlin doesn’t know what he is doing, but not playing Boyd to evaluate him could lead to a lost opportunity. On a brighter note, rookie tightend, Jesse James had a no drop night compared to the two he had the previous week. And newly acquired kicker, Garrett Hartley made both field goals, including a 48-yarder. The team signed Hartley this week to replace Shaun Suisham, who is out for the season with a knee injury. Other injuries to update, LB Lawrence Timmons did not play because of a toe injury. RB Josh Harris left the game with a foot injury.